Every walk in the forest can be enjoyable, in my opinion. Greek gyros, and, for the dessert, garash is an unexpectedly good combination, in my opinion. How can it be unexpected when you already know how good it is? If something turns out to be better than what someone used to expect before trying it, this means that it is unexpectedly good. Therefore, the phrase "unexpectedly good" means "better than what I used to expect it to be before I knew it. Kazakhstan is a country, and Astana is its capital city. Learning geography is always cool. My friend, thank you for the nice words! Nine is a nice number. Often is a word which I would acronymize as "Obviously frequently - that's every night". Perhaps that's a good acronym. Quite valuable and nice is to get such a compliment from the person, known as The Expert Of Acronym Making. Thank you. Regular sleep is important for a healthy lifestyle. Scientists say smartly sophisticated sentences sometimes. I respect them. Unbelievably warm and sunny, indeed - and I like this very much! 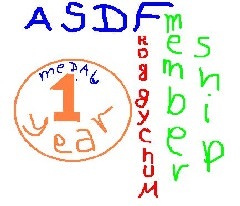 Welcome back to activity on ASDF, Froggychum! Nice to see you again. I missed you.